Music awakens and stimulates neural pathways in the brain that are associated with higher forms of intelligence, such as abstract thinking, empathy, mathematics and science. Music's melodic and rhythmic patterns provide exercise for the brain and help develop memory. Remember singing the ABC song to learn your ABC's? Studying music helps children establish good listening habits, which are essential for achievement in school. 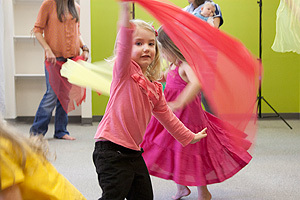 Overall, music activities are perfect for child development. Music immerses the child in language, evokes movement, stimulates the brain and fosters physical coordination - all in a group setting that builds community - a holistic experience. Classes for babies and toddlers are 30 minutes per week. Cycle of Seasons classes are 45 minutes, Music Maker at Home classes are 60 minutes and both Music Makers Around the World at the Keyboard and Music Makers at the Keyboard classes are 75 minutes per week. Only Musikgarten has a program that addresses the unique developmental needs of children at each age. Each of the classes are interrelated, as they were written for children to grow-up with Musikgarten. This sequential planning also makes it easier for the students to grow in their musical competence and graduate to instrument playing. Parents are an integral part of class in the younger years. As students get older they participate by themselves, but parents take part in the classes towards the end of each lesson. For all classes, parents are asked to include active music making in their child’s life. Sing along with the CD. Play echo games, making up patterns, as we do in class. Put the picture cards or notation games on your refrigerator and play identification games with them as you get ready for dinner. More structured practice is required when the children get to Music Makers: At the Keyboard. Yes. 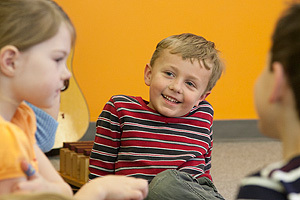 Musikgarten classes develop students aural senses more than other pre-piano methods. The Music Makers: At the Keyboard classes are taught in a group session, so that children learn from each other and grow in their comfort of playing with and in front of one another. Children and parents can have so much fun at home and in the car with Musikgarten songs and dances. In class you learn the songs, but at home is where you really have fun with the songs and dances. It's a great family bonding time. Try it and you won't have to ask this question ever again! The Music Garden allows younger siblings to tag along to Toddler and Cycles classes. There is no charge for the tag-a-longs. After being in the program for a while, you can see the benefits your child is getting from class. 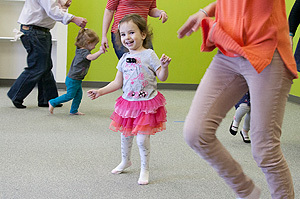 It is our view that the singing, dancing and playing (in class and at home) is the best for your child's wholistic development: language, movement, math skills, and physical coordination - all in a group setting that builds community. While other activities can be fun too, we strongly propose that the primary building block of your child's developmental time is best spent with Musikgarten. when the pressures at school mount - more homework, more testing - music can often provide the relief valve for stress. It can be the one open, expressive and non-judgemental treat in life.